Shower chairs on wheels make it easier and safer for seniors to bathe and use the commode. They allow for efficient transferring, and the different options allow caregivers to assist seniors without straining their bodies. These shower chairs come in many varieties, so it may seem hard to determine the best one for your needs. However, we’ve done some heavy lifting to make the process easier for you or the senior in your life. Here you’ll find four of the best shower chairs with wheels that are available today. This chair has a soft seat, anti-slip handgrips, and it is cut-out for bathing and toileting. The MJM International Standard Shower Chair is a simple shower chair. The material is water resistant, so that the chair will dry quickly after you use it in the shower. The soft seat ensures comfort when you are sitting, and the cutout allows for easier cleaning of your body during a shower. We also loved how much more convenient this item made toilet use for seniors. The hand grips are anti-slip, providing stability while using the chair. The chair includes reinforcements in the most critical weight-bearing areas to provide a sturdy solution. This seat has a footrest to make transferring easy, and the vinyl seat and arms are comfortable. 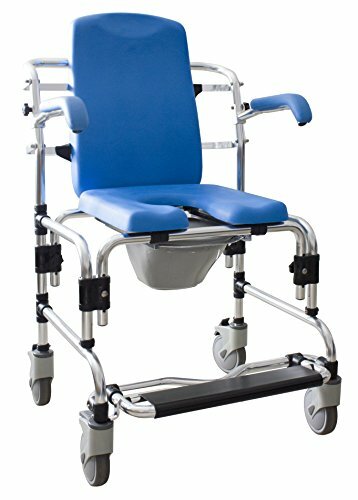 The DMI Shower Transport Chair has a padded seat and locking wheels for comfort and safety. The seat is a vinyl material, so it is waterproof. The backrest is also a waterproof material. The wheels glide easily across most surface types, including thick carpets, which we found convenient for those living in homes with varying surfaces. The wheels are each 4”, so they can also glide across your home’s doorways and thresholds with relative ease. The armrests ensure greater stability when you are in the shower. They help to prevent seniors from sliding sideways or falling off the side of the chair. The armrests also allow you to push yourself up and off of the chair once you are ready to transfer. This chair is ideal for bathing and commodes, and it has a higher back for added comfort. PROFESSIONAL GRADE Construction includes rust-free aluminum frame and institutional-quality, rust free polycarbonate casters. FLIP UP ARMRESTS make transfers to and from the chair safe, efficient and convenient. 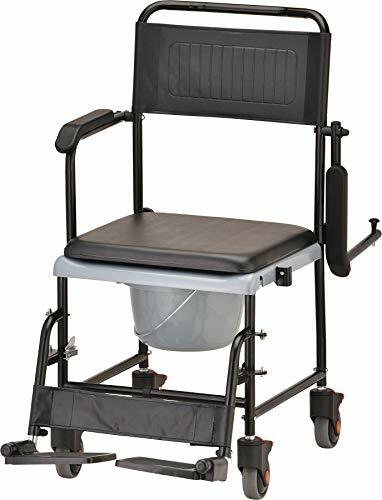 The Caspian Professional Mobile Shower/Commode Chair makes toileting and bathing easier and safer for seniors. The chair is lightweight, so you can move it around even when you do not have a lot of strength. The open base allows the chair to slide over most standard toilets. The splash guard prevents urine from spraying when you are sitting in this chair to use the toilet. The aluminum materials will not rust, even with frequent use in a wet environment. Since the chair is on wheels, there is no need for you to transfer from a wheelchair to this chair in a small bathroom. The backrest ensures greater comfort and stability when you are sitting in the chair. This backrest is also ideal for those who need extra neck and head support. The arms drop down to make transferring easier, and the padded seat fits over the commode element. 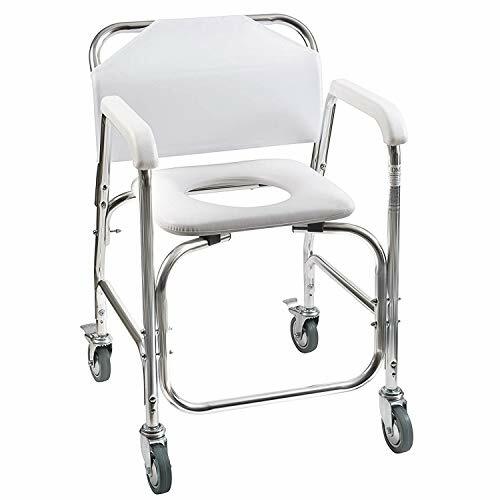 The NOVA Medical Products Drop Arm Transport Chair Commode is both a commode and a transfer chair. This dual-purpose chair allows seniors and their caregivers to maneuver easier. 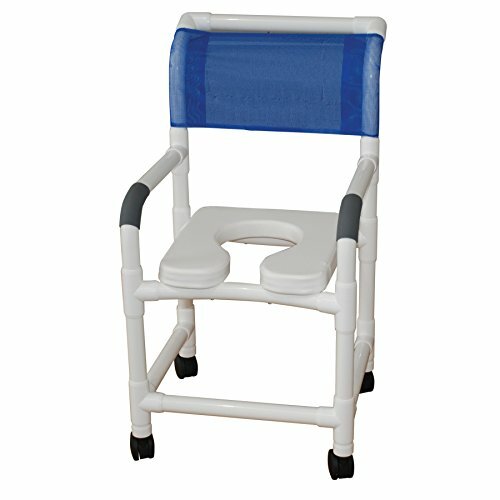 This chair also makes it possible to toilet in any private place by removing the padded seat element. The arms drop easily to open the side of the chair. The footrests swing away, allowing you to get into and out of the chair safer and faster. The rear wheels lock so that the chair remains securely in place when you are entering or exiting the chair. By dropping the arms, this makes it easier for you to transfer into and out of the shower. You can also remove the footrests quickly if necessary. Shower chairs on wheels making toileting and taking care of your hygiene needs safer and more efficient. This type of chair is a good tool for seniors who cannot stand for prolonged periods of time. These chairs are also ideal when your strength and balance make it difficult to toilet and bathe. Standard chair: A standard chair has three to four legs and a stationary seat. This chair is a basic option for greater safety when you are bathing. Foldable chair: Foldable chairs are convenient for small spaces because you can fold them up and remove them from your shower when you are not using them. You might also consider this type if you travel often. Swivel chair: This type of chair has a swiveling seat to make entering and exiting the shower more convenient. Seniors in wheelchairs may find this chair easier regarding transferring. Bariatric chairs: Those who weigh 250 pounds or more might consider a bariatric chair. This type can support more weight, and the seat is usually deeper and wider to ensure comfort. Some chairs have legs that allow you to adjust the height. If you are especially tall or short, this can be a good option. When the legs are at the right height, it is safer to enter and exit the chair. The proper height also promotes greater comfort when you are sitting. The feet may have wheels or rubber feet. Wheels make it easier to transfer seniors with limited mobility since you can wheel them directly into the shower. Just make sure that the wheels lock so the chair does not slide around during bathing. Some handles and armrests are stationary while others move. The movable type may make it easier to enter and exit the chair. Just ensure that they remain in place in the down position for safety during use. Those who want to stand up to exit the shower should ensure durable armrests. These make it easier to lift your body if you have leg weakness. The seats on these chairs come in several options. Some seats are cutout, making them ideal for both showering and toileting. Some chairs will also have an attached commode for additional convenience. The chair should be comfortable and wide enough to accommodate you. One with some padding may be beneficial. Some chairs have seats that swivel or rotate. Those who need to transfer to and from a wheelchair may find this option safer and more convenient. The two primary considerations are the height and width of the seat of the chair. Measure your bottom, from your left hip to your right hip. This information helps you to choose a seat that is wide enough to ensure comfort. The height should be at a level where you can firmly plant your feet on the ground when you are sitting. The proper height ensures safety and greater ergonomics when you are using the chair. The bathroom can pose significant safety risks for people of all ages. Water can splash out of the sink or tub onto the floor and create especially hazardous conditions for seniors. Shower safety is crucial, and each of these shower chairs present a reliable solution for those in need. Depending on personal needs and arrangements, we’re confident seniors and caregivers will be able to find a chair here that gets the job done right.